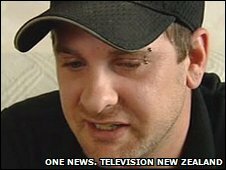 A New Zealand man says he found confidential data about US military personnel on an MP3 player he bought from a thrift shop in Oklahoma. Chris Ogle, 29, said: "The more I look at it, the more I see and the less I think I should be looking." The files included names and telephone numbers of American soldiers, according to reports by TV New Zealand. One expert says the files are unlikely to compromise security, as most of them are from 2005. Some included a warning that the release of its contents is "prohibited by federal law". As well as personal details of US soldiers, such as social security numbers, the files also listed pregnant female troops and apparent mission briefings in Afghanistan. Peter Cozens, director of the Centre for Strategic Studies, New Zealand, said the information should not be in the public domain but it did not appear likely to affect US national security, according to the Associated Press news agency. "This is just slack administrative procedures which are indeed a cause of embarrassment," he said. Mr Ogle, from Whangarei, said he would hand the files to US officials if asked. There was no comment from the US Embassy in New Zealand. Similar breaches occurred in Afghanistan in 2006, when US investigators reportedly bought back stolen flash drives that contained sensitive military data from shops outside a main US base in Bagram, according to AP.